"Results indicate that pre-harvest SARs in the range of 4 percent -- 6 percent are associated with historical (pre-1970) levels of productivity for Snake River spring/summer Chinook," the report says. Snake River fish are decidedly not reaching this target. On the other hand, the report says that "Mid-Columbia River wild spring Chinook populations, as represented by the John Day River and Yakima River aggregate groups, have experienced SARs generally within or close to the range of the NPCC 2 percent -- 6 percent SAR objective." SARS for those chinook populations were 3.9 percent for the John Day River wild spring chinook and 2.4 percent for Yakima River fish (2000 -- 2013). John Day, Deschutes and Yakima rivers wild steelhead SARs also fall within the Council range. For the 2010 migration year, SARs were between the low returns from 2009 and the highest returns from 2008. SARs for 2010 ranged between 0.20 percent and 0.97 percent. The first of the CSS studies was in 1996. Its objective was, and continues to be, to establish a "long-term data set of annual estimates of the survival probability of generations of salmon from their outmigration as smolts to their return to freshwater as adults to spawn (smolt-to-adult return rate; SAR)." The question the study addresses each year is whether collecting juvenile salmon at lower Snake River dams and transporting them downstream of Bonneville Dam where they are released, compensates for the effects of the Federal Columbia River Power System on "the survival of Snake Basin spring/summer Chinook salmon that migrate through the hydrosystem," the report says. The Comparative Survival Study of PIT-tagged Spring/Summer/Fall Chinook, Summer Steelhead, and Sockeye, 2015 CSS Annual Report (BPA Contract #19960200) can be found on the Fish Passage Center website, or at the Bonneville Power Administration website. The CSS is a long-term study within the Northwest Power and Conservation Council's Columbia Basin Fish and Wildlife Program and is funded by the Bonneville Power Administration. The Fish Passage Center coordinates the PIT-tagging efforts, data management and preparation, and CSSOC work. All draft and final written work products are subject to regional technical and public review. The annual report's main focus is the smolt monitoring program, which is designed to provide a long-term consistent and continuous juvenile salmon and steelhead passage characteristics data time series, the report says. 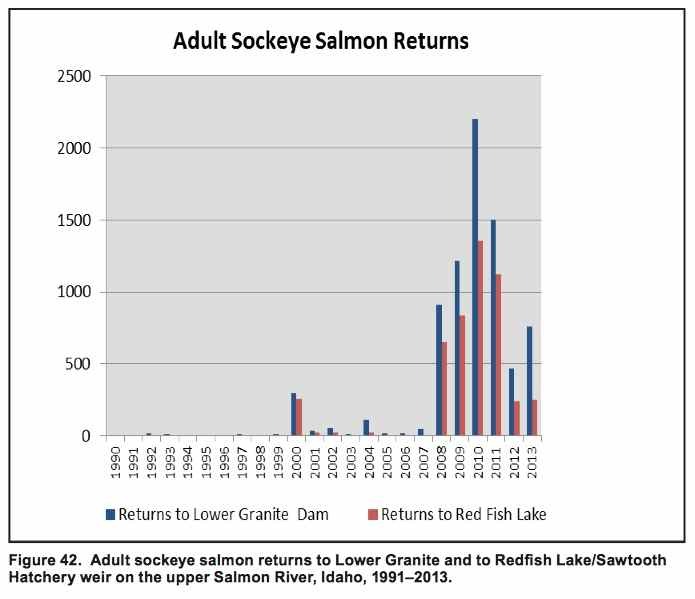 Complete return data for smolt outmigration year 2012 for wild and hatchery chinook salmon and steelhead (all Snake River returns are to Lower Granite Dam). Wild and hatchery spring/summer chinook: 3-salt returns from smolt migration year 2012, and 2-salt returns from smolt migration year 2013. Fall chinook, 3-salt returns from smolt migration year 2011, and 2-salt returns from smolt migration year 2012. Wild and hatchery steelhead, 2-salt returns, and Sawtooth Hatchery Snake River sockeye 2-salt returns, both from the 2012 smolt migration.